Horizon Adonis Plus is a good starter set for a varied strength training at home. 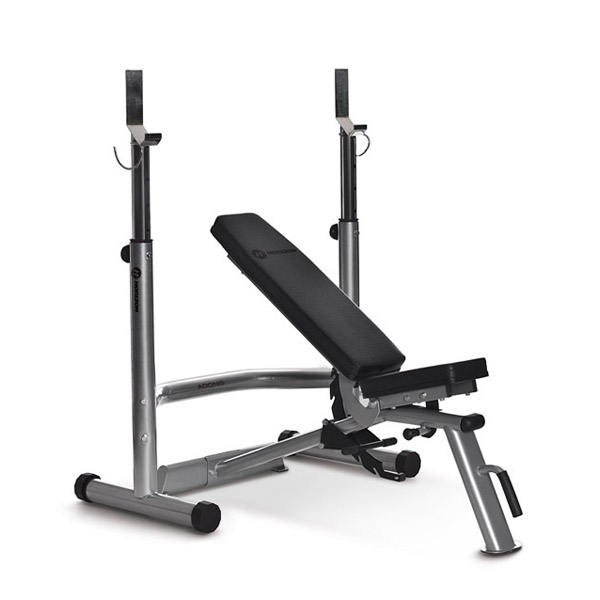 The set includes the weight bench Adonis and the Adonis Rack of Horizon. The backrest of the multi functional bench is 7 times adjustable: from right angle, incline and flat bench to negative adjustment. The seat is twice adjustable. The barbell rack can be adjusted in height in 5 levels from 92.7 to 128 cm. Do squats with a barbell on the barbell stand; together with the weight bench Adonis, the rack is suitable for bench press. The barbell rack can be loaded up to 160 kg, the training bench can be loaded up to a maximum of 280 kg (= user weight 120 kg + 160 kg barbell weight). Takes time to put it together - I enjoyed it but not sure if everyone will :). Overall quality of the bench is good - I cant say that for the rack :(. The lock mechanism that should keep the load balanced is not working. Alles sehr stabil, es wackelt nichts. Sehr gut verarbeitet, ohne Lackfehler oder Kratzer. Für den Home- Bereich absolut zu Empfehlen. Een heel robuuste halterbank die heel stevig op de grond staat. Heel handig door de verschillende verstelmogelijkheden, tot 90° wat heel goed is. Top!